Finding a family Saturday activity to entertain four kids ages 1 – 9 can be a challenge. Age limits, height requirements, and prohibitive costs get in the way of a good time. Monkey Joe’s recognizes these challenges and provides a fun, safe, active environment for families. 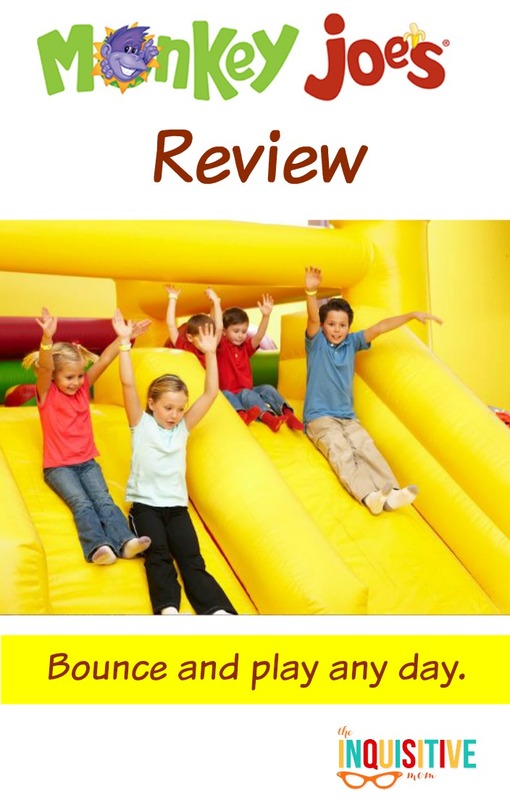 I’m excited to bring you our Monkey Joe’s Review! The winter feels never-ending and getting enough physical activity is always a concern. Our family of six headed to Monkey Joe’s in Des Moines on a Saturday to enjoy some bouncing, sliding, family fun. We didn’t tell the kids where we were going, except on a “surprise adventure.” When we pulled up to Monkey Joe’s they squealed in delight. Monkey Joe’s is an all-inclusive activity, meaning that your family signs in, pays, receives wristbands, and enters a secure area. If you have older children playing, you can comfortably watch them without shadowing their every move. No one can leave without passing through a secure door, so no need to stress about toddlers trying to make a run for it either. We planned ahead for the day by telling our kids to wear socks (a requirement for bouncing) and giving them each $5 to spend as they wished (no outside food or drinks allowed). The big kids ran from bouncy house to bouncy house, while dad and I took turns helping the younger kids bounce. The venue was very busy because it was a Saturday and filled with families, kids of all ages, and birthday parties. Safe.Children receive wrist bands matching them to their parent. These wrist bands are adhered from the minute the child steps into Monkey Joe’s, and are checked by Monkey Joe’s employees upon exiting the facility. Separate bouncy spaces for children 3 and younger. This means that toddlers should be able to play and jump safely (in theory) without bigger kids bumping into them or knocking them over. They are also sanitized and include softer, smaller obstacles. A Variety of bouncy spaces. Our kids loved the different themed bouncy houses, as well as the tall, wide, and short slides. Family friendly space. No one is going to ask your kids to quiet down at Monkey Joe’s. This is a laugh-out-loud, yell for your sister, scream in delight kind of a place. Great for different ages. We often run into an age divide at these type of venues, leaving our 4 year-old out. We liked that he could run with the big kids (if he could keep up). All-Inclusive Birthday Parties. Want a hassle-free party? 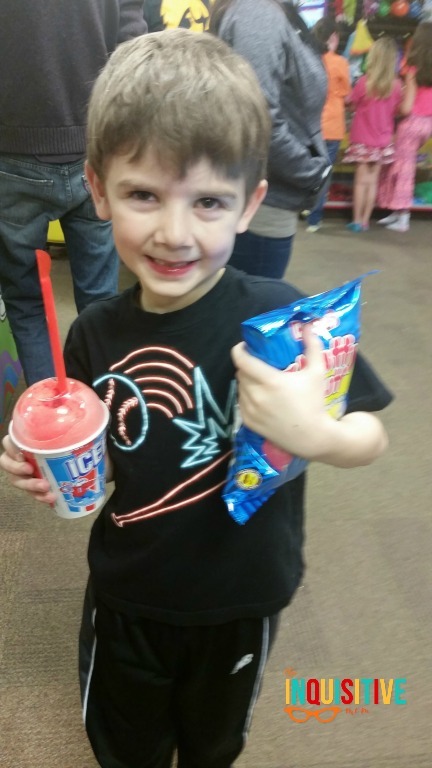 Monkey Joe’s will do the set up clean up, and everything in between. You can even bring in your own birthday cake! Walk-ins Welcome. You don’t have to call ahead or reserve a spot to play. Weekday Pricing. Plan ahead and take your kids on a weekday to save. Wednesdays are half off. Parents are Free. We thought we’d get to bounce with our kids, but we were pleased that there was no cost to chaperone – one of my biggest pet peeves at family venues. Commitment to Hygiene. All Monkey Joe’s locations have committed to full jump sanitation from Swisher Hygiene, the country’s leading provider of commercial hygiene services. Monitor toddler spaces. While we loved these spaces for our 1 year-old, they were often overrun by older kids. Employees rarely monitored the area, adult seating was minimal, and announcements over the intercom telling kids to leave these spaces were unintelligible. Family bounce spaces. My husband and I would have loved to safely bounce and slide with our kids, rather than staying on the sidelines. More seating. Most likely because it was the Saturday rush, seating was at a premium. It was challenging to find a central location to sit and watch kids or a table to eat snacks. Additional Employees. I would love to see more employees at the busy food counter (as you can’t bring in outside food) and monitoring the bouncy houses. My kids sometimes felt overwhelmed by pushy kids who were not well chaperoned and toddler areas crowded with big kids. 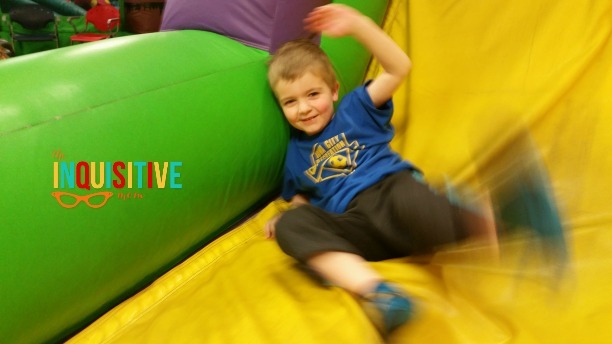 Overall, my family had a fun Saturday afternoon bouncing and playing together. I would love to get a pass and visit on weekdays when things are bound to be less crowded. 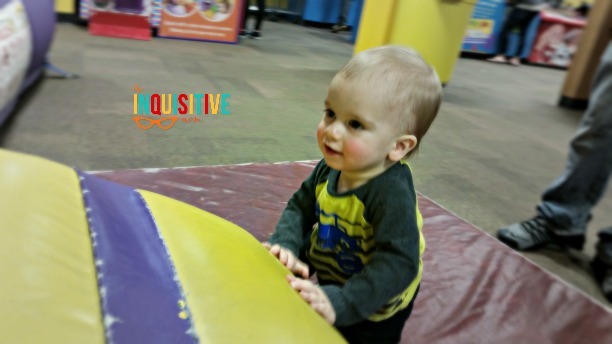 Thinking about visiting Monkey Joe’s? You can find one in your area here. You can also save $2 at the Des Moines Monkey Joe’s with this coupon. Monkey Joe’s is a fun and exciting inflatable-filled indoor play and party center that provides families with engaging and interactive activity and entertainment — all day, every day (no special occasion necessary!). Monkey Joe’s is located at 1600 Valley West Drive, Ste 200, West Des Moines, IA. Operating hours are Monday – Saturday, 10am – 8pm and Sunday 11am – 6pm. The store phone number is 515-223-5867. Disclosure: My family received complimentary tickets to facilitate this review. All opinions are my own.